*Update* Tickets to this event are now sold out. Thank you to everybody who bought tickets. I have left this post up so you can still go to the Team Adem website is you wish. Other events including a Fun Casino Night are planned through the year. Thank you for your support. This notice is not about a casino event but instead a charity fundraising Trivia night. Team Adem is a charity supporting the Leukaemia Foundation. They are holding a “Hollywood” style night with the stars evening, full of trivia, fun & entertainment. November 7th at 6:30 pm at the Buderim Hall. Please support Team Adem at this prestigious event. Tickets are available here. But get in quick as they sell out quickly most years………Read below. 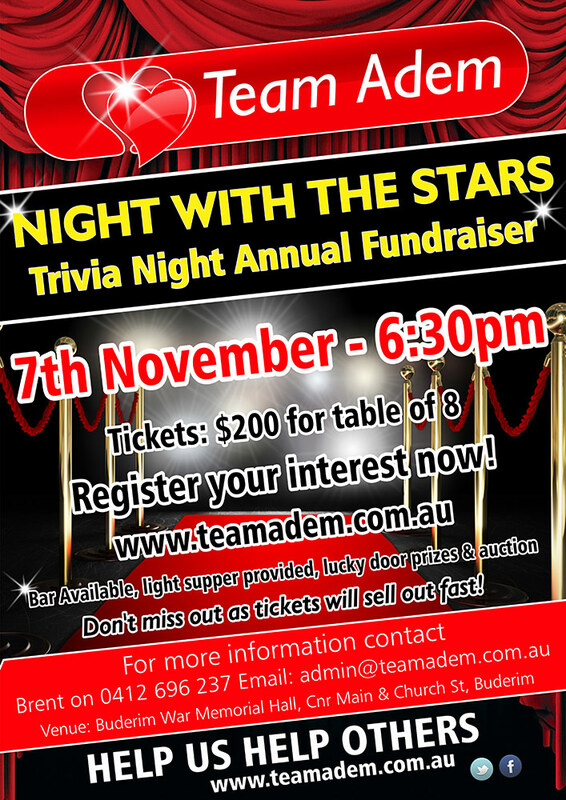 Join Team Adem as we roll out the red carpet and welcome Hollywood’s greatest Stars to Buderim for our ‘ Night with the Stars’ Trivia Night Fundraiser. This once a year event is going to be filled with Glamour, Glitz, Trivia and a room full of Hollywood/TV celebrities. Register your interest now to secure one of our last few tables for an unforgettable night of fun while supporting Team Adem’s annual fundraiser. Tables of 8 will be $200 per table, which will include a light supper. A bar will be available. Lucky door prizes, raffles and an auction will be a part of the night’s activities. Each Table is to nominate a captain and a Movie Theme/TV Program for your table eg, Star Wars, Grease, I Dream of Jennie, Breaking Bad etc. Everyone on the table is encouraged to dress in your chosen theme. Team Adem will send out a payment link when we receive your registration.